Three little ducks! Yes I’ve made it to ATC 222 and before we are half way through the year too! Whoop! Anyway this was a stamped image from a Hotpicks Paperartsy stamp set I had stamped as an extra for another project and it was left on my desk so I made it into an atc. I grabbed some precut card and painted it with black gesso. I then layered some gold Angel hair to poke put from under the image. 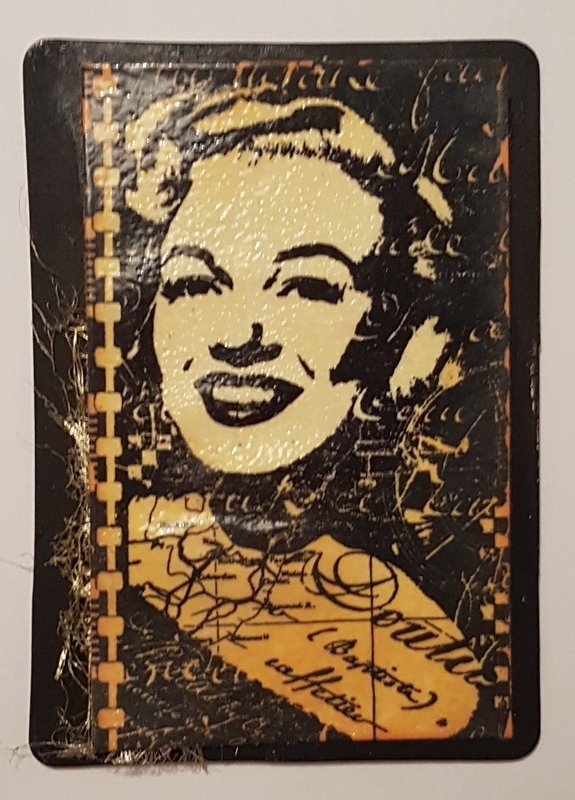 I took some of the spiced marmalade distress oxide ink and edged the inage and then I added versamark all over so I could heat emboss the panel. Whilst this might not be the most inventive use of this stamp I love how the piece looks overall with the mix if textures going on. Can someone also confirm to me if this is Marilyn Monroe I wonder? I think it is but could be mistaken!